It is wonderful to come across completely new information on one subject when you are searching for information in a completely different area. In my case, I was looking for background on Edward Tullidge and why he was in New York City in 1866, and I discovered the Edward Tullidge who tried to create a Mormon literature in 1864. I also discovered that my impression of Tullidge, as an inconstant and unfaithful Church member involved in the Godbeite schism, was not a fair impression. And I came to the conclusion that we, in Mormon letters, need to give Edward Tullidge, the author, poet, playwright and editor, more attention when we look at Mormon literary history. The exodus of most of the Mormons in the United States to a part of “Upper California” (now Utah) starting in 1846 interrupted publishing by Mormons throughout that country. Of the Church’s three official publications, the Times and Seasons closed down that year, as did the New York Messenger (successor to the Prophet). 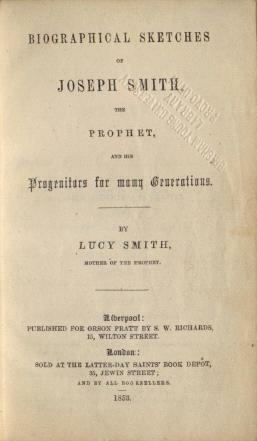 This left the LDS Church, under the leadership of Brigham Young, with just one official publication, the Millennial Star, published in Manchester, England. Is ‘Celestialized’ a Mormon word? While working on a translation of Nephi Anderson‘s Added Upon earlier this week, I came across a passage where he uses the word Celestialized. Of course, I couldn’t find the word listed in my bilingual dictionary, and it occurred to me that this must be a fairly unique word–one that isn’t used very often outside of Mormonism. Author WmPosted on 08/28/2009 Categories LanguageTags Added Upon, Authored by Kent Larsen, Journal of Discourses, Millennial Star, Nephi Anderson14 Comments on Is ‘Celestialized’ a Mormon word?